Whether it’s Vail native Mike Johnston running for U.S. Senate with combating climate change as a key campaign plank or former Summit County commissioner and now head of the Colorado Department of Natural Resources Dan Gibbs testifying for wilderness protection in Washington, mountain-town policymakers have been coming out swinging on behalf of the environment lately. 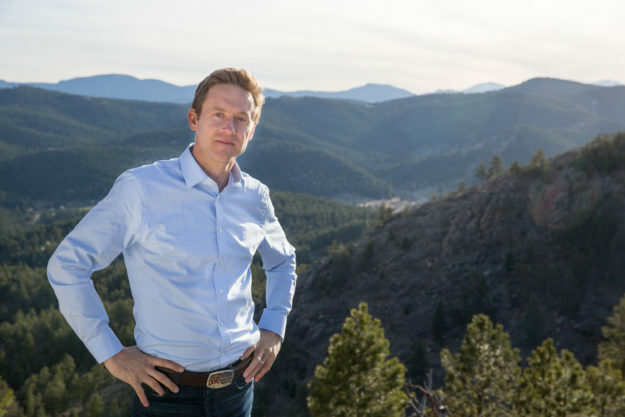 Johnston, a former state senator whose late father was once mayor of Vail, is seeking the Democratic nomination to challenge Republican Sen. Cory Gardner in 2020. The Vail Mountain School grad called for a statewide 100-percent renewable-energy transition when he unsuccessfully ran for governor last year (finishing third), and he did so before eventual winner Jared Polis announced the same plan. “People want a senator who they feel is going to represent all of the state, and they just feel like Gardner is following [President Donald] Trump over the cliff on so many things that are terrible for Colorado,” Johnston told RealVail.com back in January when he first announced his candidacy. He rattled off a list of Gardner’s perceived failings, with climate issues near the top. Johnston’s message is clearly resonating with voters as he set a first-quarter fundraising record of $1.8 million, his campaign announced on Tuesday. A Gardner campaign spokesman did return an email requesting comment. Colorado’s “Ski Town Caucus” – a group of Democrats from high-country towns and counties reliant on the ski industry and outdoor recreation economies – is using the last month of the legislative session to take bold action on climate change they say threatens their lifestyle. “People talk about the war on coal. We talk about the war on powder [snow]. It’s critical,” Eagle County Commissioner Kathy Chandler-Henry said when asked why she signed a letter seeking stricter statewide standards for methane emissions from oil and gas drilling. Colorado’s rules to cut methane and ozone pollution from oil and gas drilling — first passed in 2014 — only apply to the state’s more populous Front Range. Clean-air advocates are urging the state’s Air Quality Control Commission to make the rules statewide to cover heavily drilled Western Slope counties like Garfield and La Plata, where there’s a methane hot spot. Gov. Jared Polis on Friday announced the state will not seek an extension for attaining the federal government’s 2008 National Ambient Air Quality Standard, citing 55 days in 2018 when Coloradans on the Front Range were warned about exercising outdoors due to high ozone levels. Polis said the extension amounts to “hiding behind bureaucracy and paperwork” when the focus should be on actually complying to federal standards by reforming oil and gas laws, advancing zero-emission vehicle standards and pushing aggressively for 100-percent renewable energy. “The governor has challenged us to move quicker, and we are up for the task; clean air can’t wait,” said former Eagle County Commissioner Jill Ryan, whom Polis named executive director of the Colorado Department of Public Health and Environment (CDPHE) in January. That move mainly impacts cities along the Front Range, but the CDPHE oversees the Air Quality Control Commission (AQCC) – and that board will be very busy indeed if a handful of climate bills pass the legislature in the next month. The most momentous and potentially impactful is HB 1261, or the Climate Action Plan to Reduce Pollution. Introduced late last month, the bill is co-sponsored by state Rep. Dylan Roberts of Avon. It would codify into law a 2017 executive order issued by former Gov. John Hickenlooper calling for reducing greenhouse gas emissions 26 percent statewide by 2025. But it adds additional targets of 50 percent by 2030 and 90 percent by 2050, using 2005 emissions as a baseline. Some Republicans are warning of overreach on the issue, including state Sen. Bob Rankin of Carbondale, who in January told Colorado Politics he was worried “an overly aggressive, politically motivated and unrealistic plan for the complete phaseout of fossil fuels will be devastating to many of my constituents.” And the state GOP is pushing for recalls. Roberts represents both Eagle and Routt counties in the state house, and, while there’s no fossil-fuel production in Eagle County, he acknowledges he’s concerned about the fate of coal miners and workers at Xcel Energy’s coal-fired power plant near Hayden in Routt County. That’s why he’s also a co-sponsor of HB 1037, or the Colorado Energy Impact Assistance Act. That bill, also co-sponsored by Summit County’s Julie McCluskie and sponsored in the state Senate by Vail’s Kerry Donovan, would allow for the issuing of low-cost, ratepayer-backed bonds to mitigate against the closure of coal-fired power plants and to retrain workers. Increasingly, utilities such Xcel and Holy Cross Energy are shifting to renewable energy sources such as wind and solar, which have become cost competitive with coal, oil and gas – and those moves are proving popular with a growing number of Colorado voters. HB 1037 has already passed the house and is being considered by the Senate Agriculture and Natural Resources Committee, which Vail’s Donovan sits on. She’s also sponsoring a bill, SB 96, to compel the AQCC to annually measure the state’s greenhouse gas emissions. “It’s going to take all of the greenhouse gases and measure them,” said Donovan, adding the biggest cost of the bill will be developing the data and collection criteria. Once that’s done, she said annual reporting will give businesses better tools for cost-effectively mitigating against climate change. A 2017 Colorado State University study showed climate change is impacting the state’s snowpack and reducing the flow of the Colorado River. And scientists say snowpack is being impacted by higher temperatures and rain events during warming Colorado winters.